Oh, those sticky, sticky sheds. I am sure you all know what I am talking about if you have done warp-faced weaving with fiber like wool, llama or alpaca. I have not been heavily over-twisting my hand spun yarn and the advantage of that is a nice soft fabric but the disadvantage is hairy warps which make clearing the sheds a bit more challenging. And it is not only the woolly stuff that can create this sticky problem. When I get into wide-ish warps with fine cotton, there is also a certain resistance, created by all those warps rubbing up closely against each other, to deal with too. I had to apply a few different strategies to get the sheds to open on the warp pictured above. So, this week I made a very short video on the “strumming” that I employ to help open the shed rod shed. I am quite gentle with my strumming and just use my fingers for this width of warp. After my video segment I have added a short clip of Felicia in Candelaria using the tip of her wooden tool to strum the warps on her oblique loom. When I start working on wider warps, I will need to use my wichuña (llama bone tool) to strum. For now I just like to use the ready-made tools that I have quite literally “on hand”. 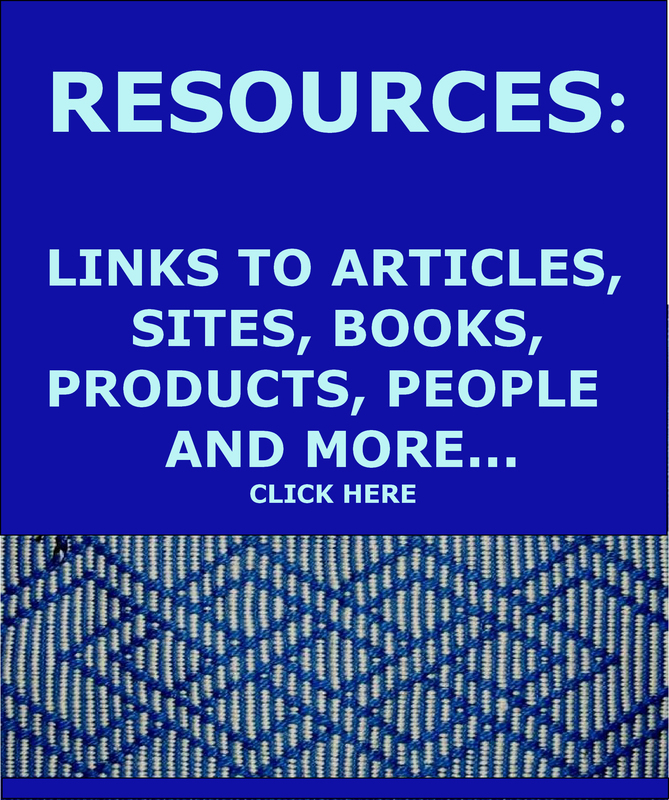 I have added this video to the FAQ page on this topic. That page already has a video I made showing how to open the heddle shed on wide and/or sticky warps. Hopefully these tips will help you to create clean sheds without any kind of heddle wrestling and the pilling and possible warp breaks that that can cause. I also added another thing to the FAQ pages behind the scenes in response to people who were having trouble rolling up their warps. There is an FAQ page here on my blog showing how to roll up your weaving as you advance so that you can always be in easy reach of the heddles and weaving line. The method I show is dependent on two things: the second stick which you use to roll up the weaving needs to be of similar girth to the loom bar and the cords on your backstrap loom need to be chunky. 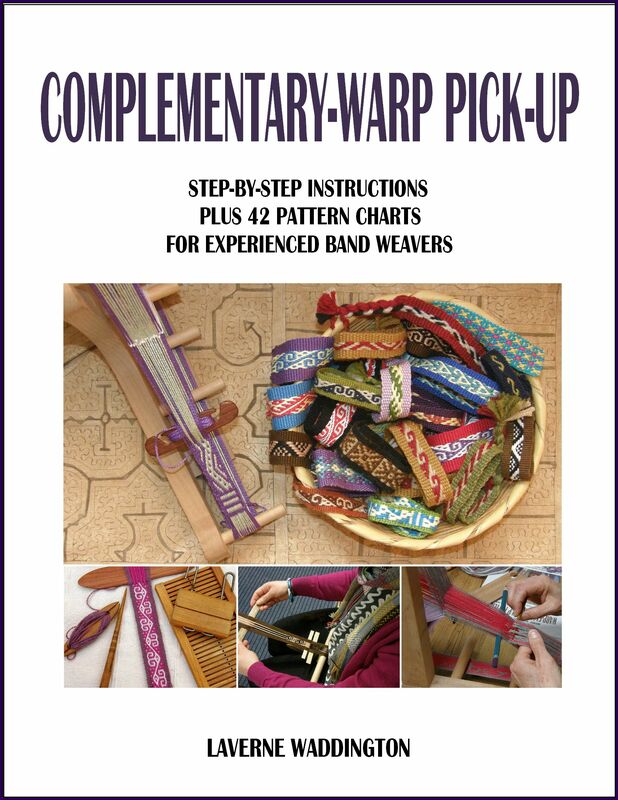 However, some people just use string or twine for their backstrap cords and so I have put together some step-by-step pictures for another, and far more common, way to roll up the warp. You can see that here. You may be wondering about this green apple and eggplant warp that keeps appearing in this post. That is the second place mat in the set of four that I am making. The design is based on what I am assuming was a Mexican belt that I was shown when I was traveling in the US recently. The belt was also made in purple, green and white but the tones of purple and green were completely different to those I used and were subdued and worn with age. I used the same two-color alternating warp float technique. 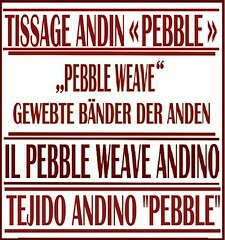 It all looks very pebbly but it isn’t pebble weave. This is not a complementary warp structure. 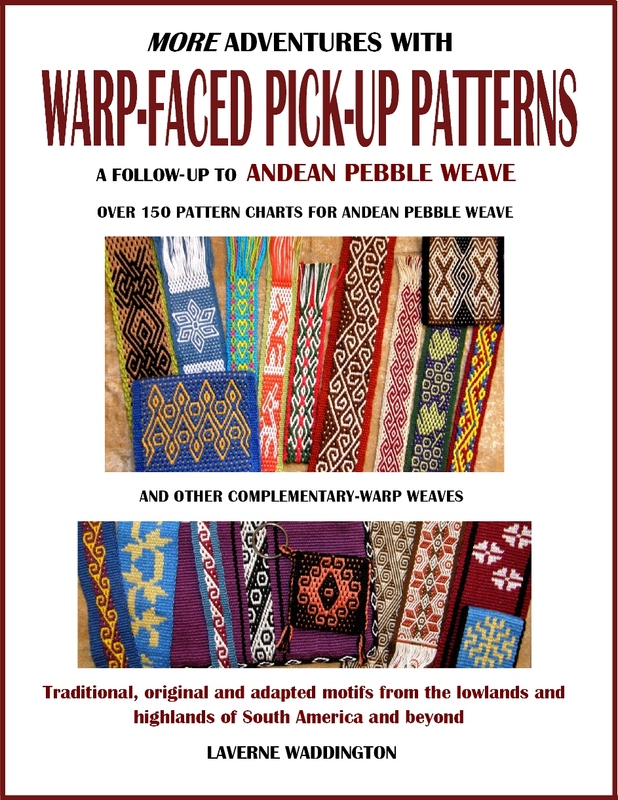 What I particularly liked about the Mexican belt was the weaver’s use of supplementary weft along with the warp floats to introduce a third color. Some of the supplementary wefts had in fact deteriorated thus exposing parts of the horizontal bars and I liked the way this looked and so incorporated a little of all these features in this place mat design. So, these two are part of a set. 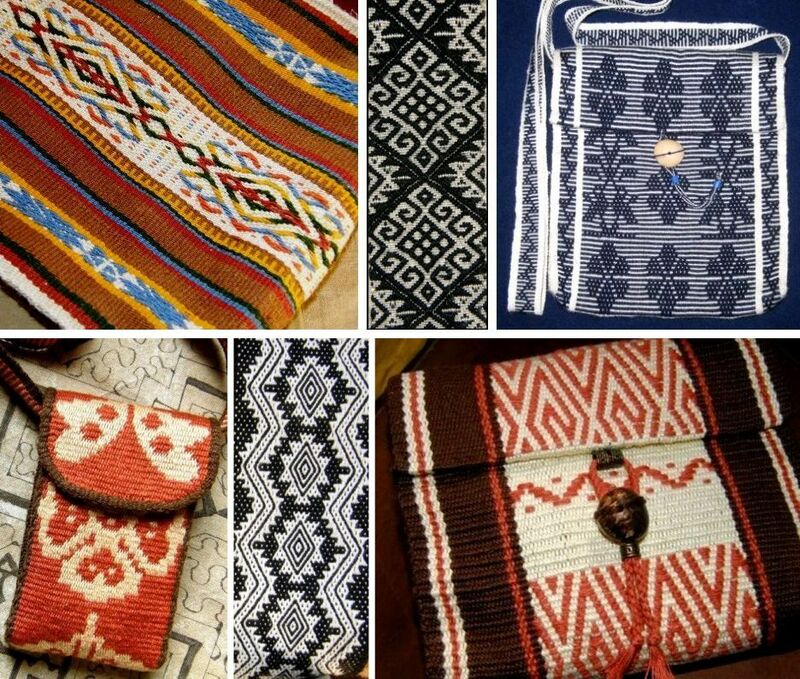 The first was influenced by Shipibo design of Peru. Could they be any more different?! I am looking forward to seeing a table with my four colorful and vastly different place mats and I am already planning the runner for the center. Actually, there are a few elements that tie these two pieces together. The pick-up technique in both is the same, that is, two-color alternating simple warp floats (or “warp floats galore” as I called it on my tutorials here). The little “X” design on the sides will be common to all as well as the weft-twined ends. I confess that I spent a lot more time at my loom this week than at the spindle. Maybe it’s because we have returned to our warm tropical splendor (although my Montagnard weaving teacher, Ju Nie, rolls up her warp for the summer and won’t touch it until cold winter weather once again keeps her indoors). I did put in a bit of spinning everyday but have pretty much run out of colors in my Ashford prize package with which I would like to weave. Looks like I will need to do some dyeing which is always fun. I don’t have access to this kind of prepared roving here in Santa Cruz and I really haven’t paid much attention to this stuff before. I pulled out a strange blend of pink and brown from the package and was surprised to see the nice even kind of red that spinning it produced. Then there was an odd combination of what I am calling “Siamese cat brown” and “blankie blue” and that spun up into something rather nice too. Now you can see that I am into a straight yellow…a winner’s color in the Tour de Fleece. I can imagine combining all these colors in a piece. The rest of the stuff in my bag will have to be dyed. As you may know, the Tour de Fleece is being run in conjunction with the Tour de France cycle race but there is very little interest in that over here when we have the Copa America in progress especially since I live with the Argentinean team’s number one fan. 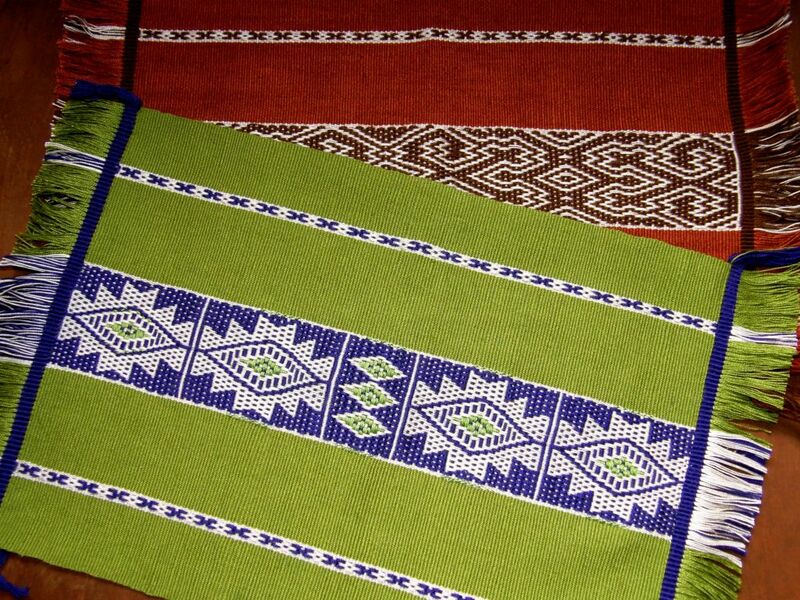 I am very pleased about having woven this first Shipibo design in my place mat set as I would like to learn more about the textiles and the people who live in the lowland regions of South America and be able to show it all to you. 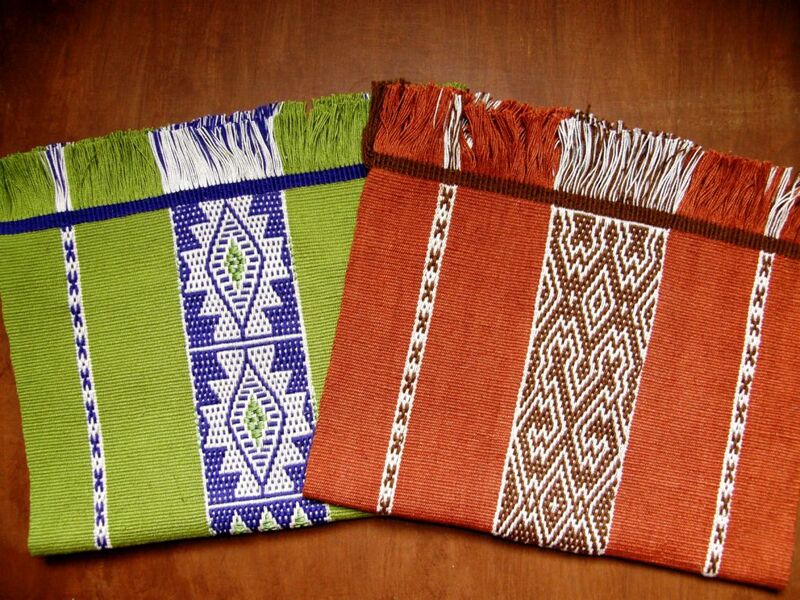 Highland weaving, particularly that of the Cusco area, has been very well promoted and exposed to the world. It is a shame that not more is known by the general public about the textiles being produced by people in the lowland areas too. Above are a few pieces I have made that have been influenced by textiles created by weavers living in the low-lying valleys, coastal regions or tropical interior of this continent. These people include the Mapuche of central Chile and Argentina, the cotton weavers of coastal Ecuador, the Guarani of lowland Bolivia and the Huni Kuin, or Kene, of tropical lowland Brazil. 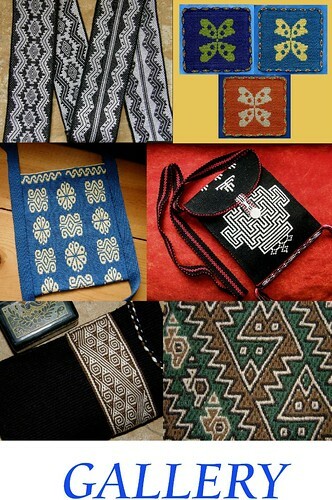 While I have used motifs of the Kene in my weavings, I have not used their technique and I give many thanks to Helena who introduced me to these people and their work. 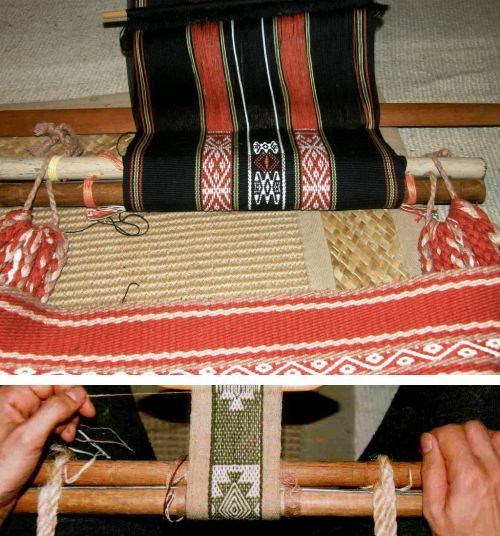 Helena has woven pieces employing their techniques an example of which can be seen above. She also gave me a link to the following video showing the Kene at work. 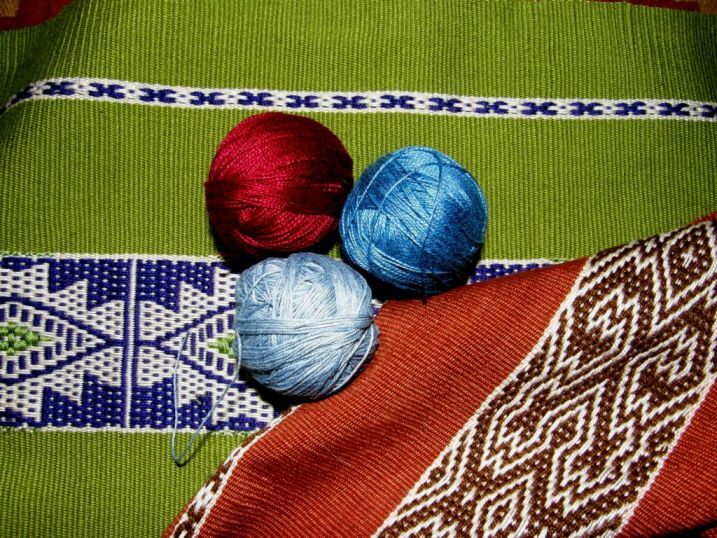 I hope to be able to study one day with weavers of the Shipibo, Mapuche and other lowland cultures as I have with my weaving teachers here in lowland Bolivia and coastal Ecuador…thanks to Kathleen Klumpp who invited me to accompany her to Manabi province, Ecuador in 2007. And this is all just a tiny part of it. 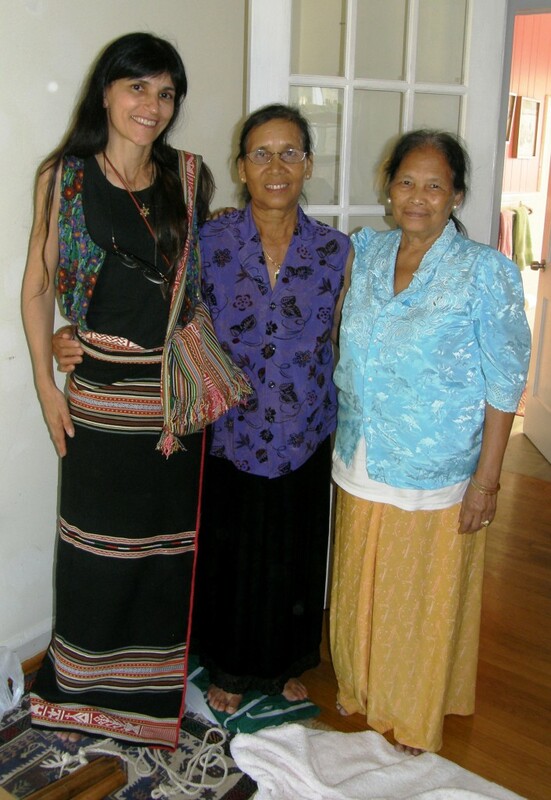 And while I ponder the multitude of places to see, weavers to meet and textiles to admire here in South America, where I have barely scratched the surface, I am forever grateful to have been able to meet and study with weavers from the other side of the planet like Ju Nie and Ngach from the highlands of Vietnam and Dar Ku of Myanmar. 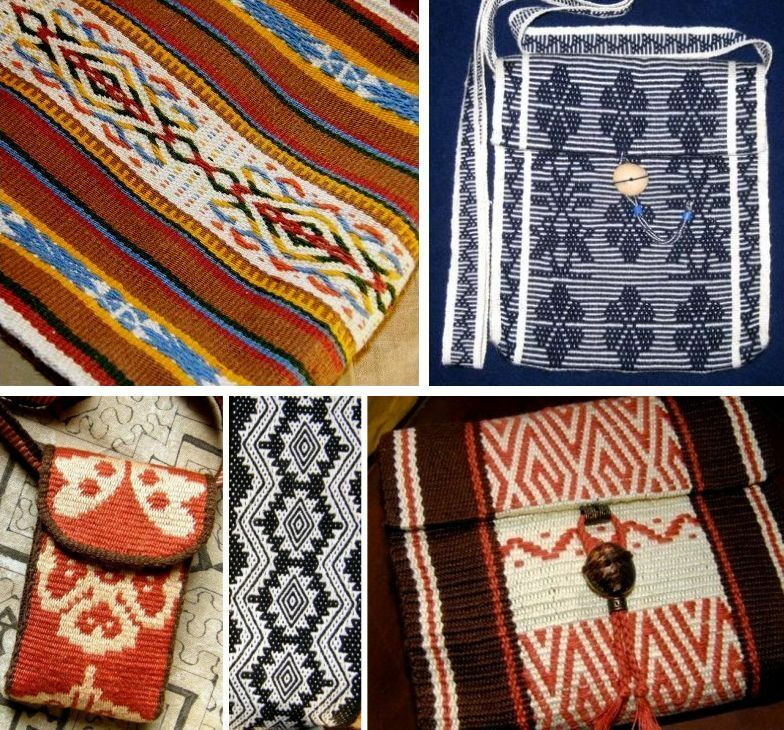 Betsy Renfrew, who is working with backstrap weavers from various Vietnamese hilltribes who have now settled in the USA, has just put a new video on You Tube about the Montagnard weavers in her community in North Carolina. 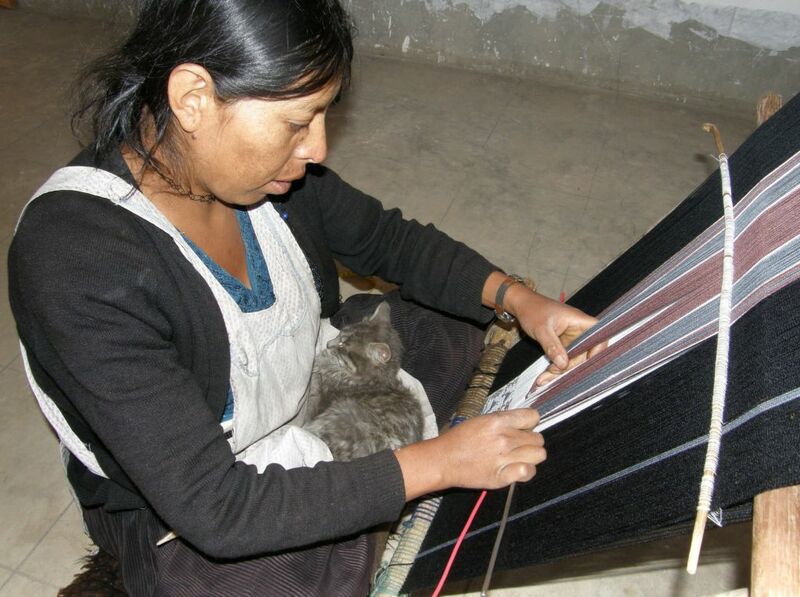 Please take a moment to watch the video and I will also give you a glimpse here of Ju Nie and Ngach at work during my visits and the beautiful textiles that they now have the means and motivation to continue creating thanks to the work of people like Betsy. I also met Naomi Northrop of WRAP Weavers in Massachusetts who does similar work with weavers among communities of refugees from Myanmar. And finally, here is Colleen’s (aka Pancha on Ravelry) daughter Kira Luna showing off “this key tool in her make-believe job as a fairy messenger”. Colleen wove the body of the messenger bag using the tutorial on a yurt band border in two-color warp floats and finished it with weft twining (I am so happy that folks are trying the weft twining!) 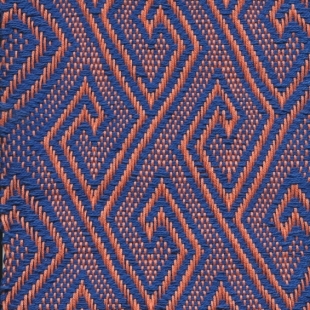 The strap was woven in double weave with a Bolivian flower motif. How cute is this?! Maybe this fairy messenger will leave me a comment. I can tell that Kira Luna believes in Fairies! She is, I’m sure a great messenger. Your place mats are coming along beautifully, Laverne. And I love the video of the Kene at work. Thanks again for a terrific blog. beautiful post. Betsy Renfrew’s video is inspirational. I like your green and eggplant coloured placemat, looking forward to see the next. Hi Anna and Janet. Thanks so much for your comments. I am glad that you have both watched and enjoyed the videos…they are so amazing. 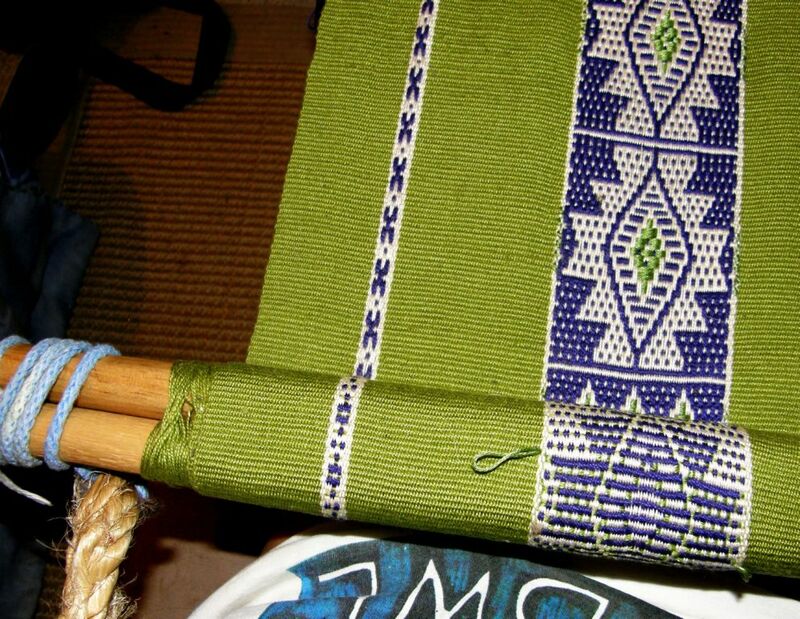 I am weaving the next place mat now and loving it! 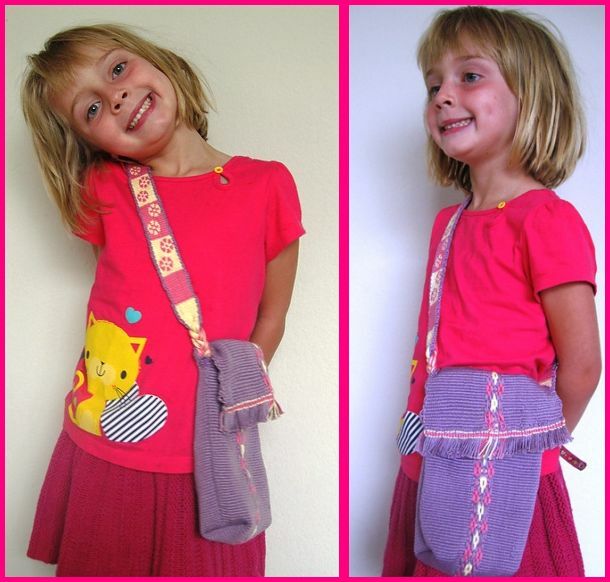 Hi Kira Luna, enjoy your messenger bag! what about sizing the warp? Hope i got the right word for this process. On looms this technique will be often used for sticky warps. Didn’t need it myself for now, but consider it for my next project with alpaca. 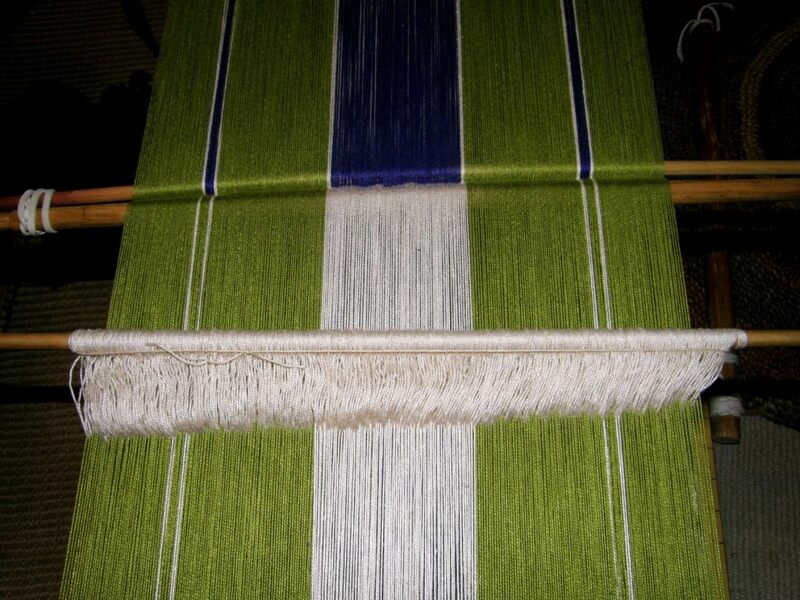 Many weavers size their warps but I don’t. It’s just me…I don’t like gunk on my warp! and have just found other ways to patiently open the sheds. None of my indigenous teachers have sized their wool warps but some of the Weavers with whom I wove in Guatemala sized their cotton. Speaking of sticky sheds…i spent two days spinning fine merino singles on a drop spindle to weave on my backstrap loom. I had had success weaving with it before, but this time was something different. I was careful with everything; I spaced everything perfectly, my heddles were lovely, and the first inch or so was easy. Then it stuck….hard. I tried strumming, I tried manually to separate the threads, but I could barely create a space large enough for my fingers, let alone my sword. I struggled and strained for what seemed like hours when suddenly, the warp bar popped right out of its rope and clocked me square in my face, all solid 20″ of thick hardwood, right square in the middle of my forehead! That wool was springy too, and boy did it hurt! Roland! I hope you are okay. I imagine you have a really nasty bump on your head. I wonder which of the two sheds you were struggling with or were both being nasty? When I am working with sticky wool I lift the threads by hand in sections slowly working my way across the warp….although, I don’t think I have worked with anything as sticky as you are describing. Are you sure your handspun will stand up to that kind of abrasion? I hope it works out for you. Take care! So far, ive been able to weave with singles about as fine as a sewing needle if I starch the threads first. I forgot to do that this time, and it was the heddle shed that did me in! Luckily the piece was small, but it did become hopelessly tangled. I’m keeping to my grandpa’s advice and not doing anything again unless I do it right, and that means remembering to starch my singles 😆 I’m also going to take your advice and try to separate the threads a little at a time if I have a sticking problem. Pictures soon!